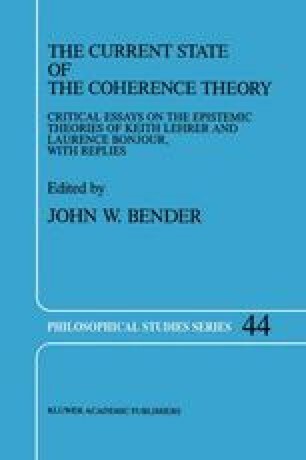 Laurence BonJour’s book, The Structure of Empirical Knowledge, is among the most detailed and resourceful efforts to present a coherence theory of empirical justification produced thus far. Although my own account of justification is different in kind from BonJour’s, there is much that I admire in his work. Some of what I admire is solidly substantive, including specific examples, arguments, and instances of philosophical theorizing. I also find admirable the refreshing candor with which BonJour approaches epistemology. There is no pretense here of having found all the answers, nor even all the questions for which answers may be required. There is instead a healthy sense of speculation and a willingness to admit that the solutions to certain problems are out of reach at the present time. This paper was originally written for a special symposium on Laurence BonJour’s The Structure of Empirical Knowledge, at the annual meeting of the Central Division of the American Philosophical Association, Chicago, Illinois, April 1987. The other symposiasts were Alvin Goldman and BonJour. BonJour’s role in the symposium was to respond to the comments provided by Goldman and me. His response was quite illuminating, and worthy of further discussion. However, I have left my paper substantially unchanged, except for minor stylistic revisions.